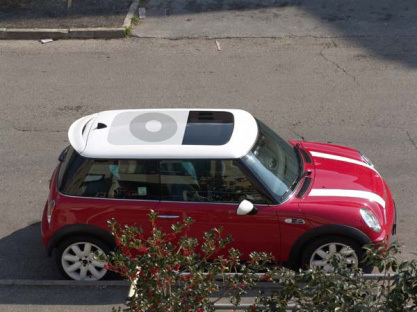 Probably you all have seen the Ipod design for the Mini Rooftop. I Love it! 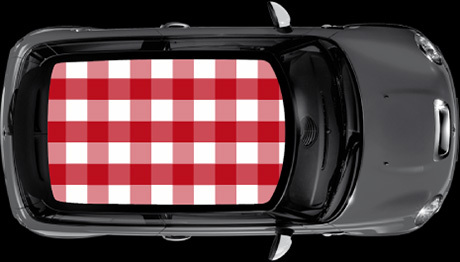 You might also know Mini offers an on line tool to Design Your Own Mini Roof Top. Unfortunately it is not possible to add your own image or logo in this tool. In the USA there is another Mini site: Roofstudio. However, I cannot get it working even after downloading the correct shockwave version to check if you can add your own design….I’m yet too busy to try it in photoshop, but I might. The winner and also my first choice is the one with the typical Checkered Dutch linnen or cotton pattern known under the name “Boerenbont” (i.e. something as “Checkered Farmer’s” see for more info in English Babylon). I don’t doubt this pattern is known elsewhere, as Dutch Merchants seem having it introduced almost everywhere. 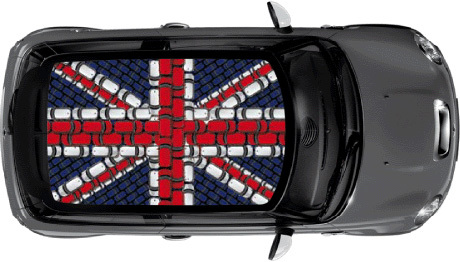 I certainly do like the association with the checkered flag that was used on many original Mini. 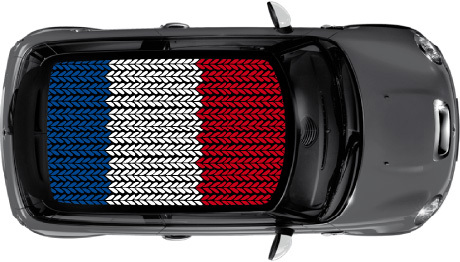 My second choice is the Knitted Dutch Flag. I have already predicted that in the direct future we are on out way back to knitting under the present economic down slide. 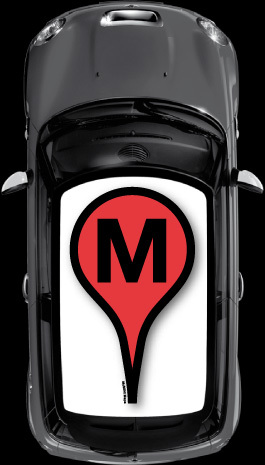 My third choice is the Google Map Mini. Almost impossible to make a stronger statement. Satellites know to find you. 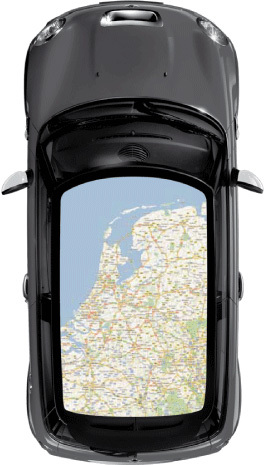 Talking about maps: This one is very Dutch with a map of The Netherlands 1:300,000 on its roof. 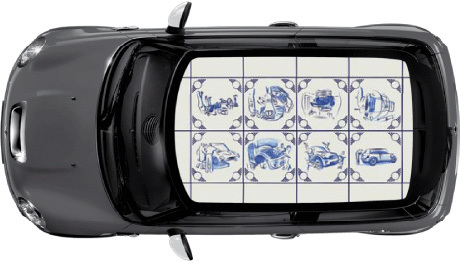 Also very Dutch is this Delft Blue tiles design. Delft Blue is still an very touristy item for Dutch export. The Royal Delft Factory is worth a visit and attracts many visitors annually. And do you see that when you click? There is also a Marcel Wanders collection for sale. There is also a Traffic Jammed British Flag nicely referring both to the British legacy of the Mini and the horrible daily Dutch traffic jams. There are many more, but maybe another time. 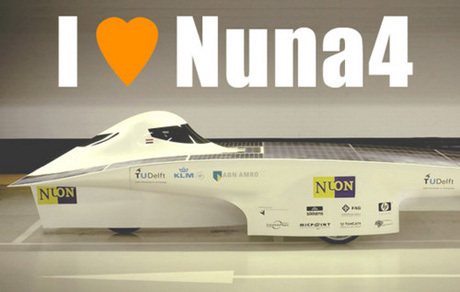 Unofficially, according to a comment on its Blog, confirmed by a post on the official WSC Blog, Dutch Nuna4 has won the World Solar Challenge. 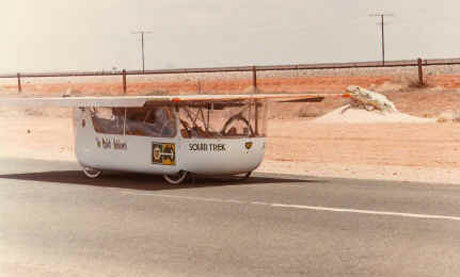 They arrived at Port Augusta at 16.54 hr local time, just 6 minutes before closing time of the control and finished the official timed stretch of the race. The Port Augusta to Adelaide (where the official finish is) leg seems not to count as a timed part of the race, as the leg has too much traffic and racing would be too dangerous. 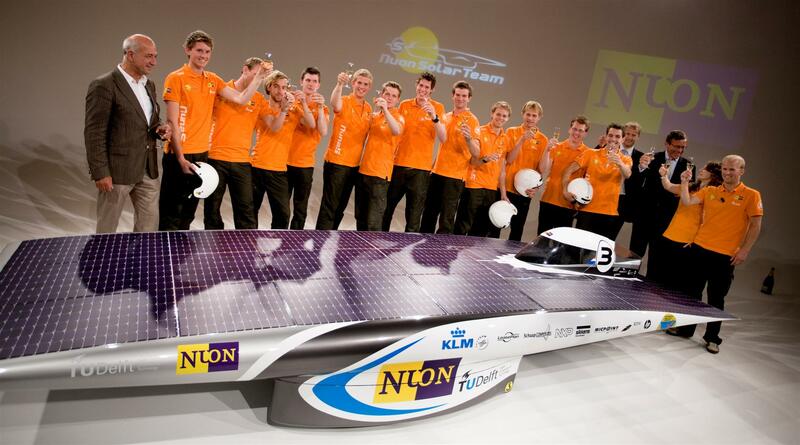 The Nuon sponsored Delft Technical University Team rules the waves (err the sun rays) as this is the fourth consecutive win on a row of this biannual challenge. Apparently they did not beat the team’s prior average speed record, because they met more clouds and rain under way. 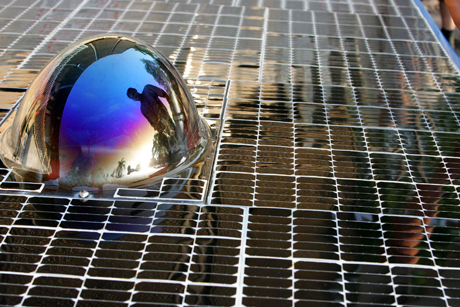 Now I am curious if they will consider competing in a solar car race in the United States of America, for instance the 2008 American Solar Challenge, a 2400 mile race from Dallas, Texas to Calgary, Alberta. It is a pity that the organization is so scarce with giving proper information. I believe there is a lot of interest for multimedia coverage of this race, but alas not much to be found…..For instance in the Volvo Ocean sailing races and in the America’s Cup match sailing races we can follow the races in real time in our armchair behind the computer while each competitor has a camera and a GPS tracking device mounted on their yachts. Same is the case with the World Rally Championships. Very sadly the US competitor of the University of Michigan, the Continuum of UM Solar Car Team, due to an accident are way, 11 hours and 24 minutes according to their Blog, behind Nuna4, but they seem to gain now. The Delft Ikea shop is able to produce traffic congestions on the motorway on its own. To my knowledge it is the only shop with its own motorway junction here in The Netherlands. Ikea has expanded the shop and will establish a center of excellence. That will serve as a pilot for new concepts and products and as training center for Ikea workers from all over the world. They need a hotel for all those students. As a small aside: Approximately 25 years ago my wife bought curtains from the first Ikea shop in The Netherlands that they closed in the meantime. 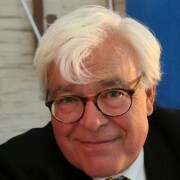 The same lady who then sold the curtains to my wife still works for Ikea, but now in Delft, and recently sold curtains to my wife for a friend’s baby room. Speaking of employee’s loyalty…. Contrary to Shell that operates its coworker/student hotel itself behind the facade of its head office here in The Hague, Ikea has outsourced management of the new hotel to the Golden Tulip Group. Last week the groundbreaking ceremony was held. Usually that means in the low lands to drive a long pole into the ground that will form part of the building’s fundament. The Ikea/Tulip Inn with 140 rooms is scheduled to open December 2008.